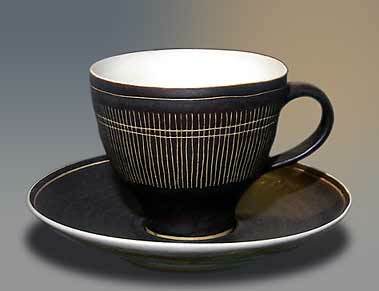 Lucie Rie cup and saucer - 3⅛" (79 mm) high. Lucie Rie was born Lucie Gomperz in Vienna in 1902. Between the ages of 20 and 26 she studied at the Vienna Kunstgewerbeschule (craft/technical school). On leaving the school she married Hans Rie - a marriage that lasted only fourteen years. Her success came early, and by the time she was thirty her work had been exhibited in France and Italy as well as her native Austria. Her work showed a strong feeling for form; like many other fine potters she was always aware that the nature of the pot was dictated by its purpose. In 1938 she came to England to escape the Nazis. The following year she met Bernard Leach and was somewhat confused by his well-meaning criticism of her work. During the war years her sense of purpose seemed to wane, but it was fully restored in 1946 when the young Hans Coper (also a fugitive from the Nazi regime) came to work with her at her London studio. Coper's intended function was to cast decorative buttons for Rie to glaze, but she soon spotted his emerging genius which rekindled her own enthusiasm and confidence. Coper worked with her until 1958. In 1948 Lucie started working in stoneware and porcelain rather than her customary earthenware. In the following years her work was exhibited very widely - in both solo exhibitions and doubling with Hans Coper. The pair benefited by promotion from Cyril Frankel, the ceramics expert and critic. Rie received many honours, becoming an OBE in 1968, a CBE in 1981 and a Dame in 1991. She was much written about, and was the subject of a BBC film. Since her death in 1995 there has been no loss of interest in her work, and she is frequently the subject of prestigious exhibitions.